Portabella mushrooms make the perfect vessel for all kinds of stuffing. This one filled with leeks, red bell peppers, zucchini, mushrooms, sun dried tomatoes, herbs, and cheese, is sure to please even the meat lovers in your family. Paired with a green salad, it's hearty enough to serve as a light dinner. Perfect for entertaining, It can be made ahead, covered and refrigerated, and baked just before serving. Preheat oven to 400F and line a baking sheet with parchment paper. 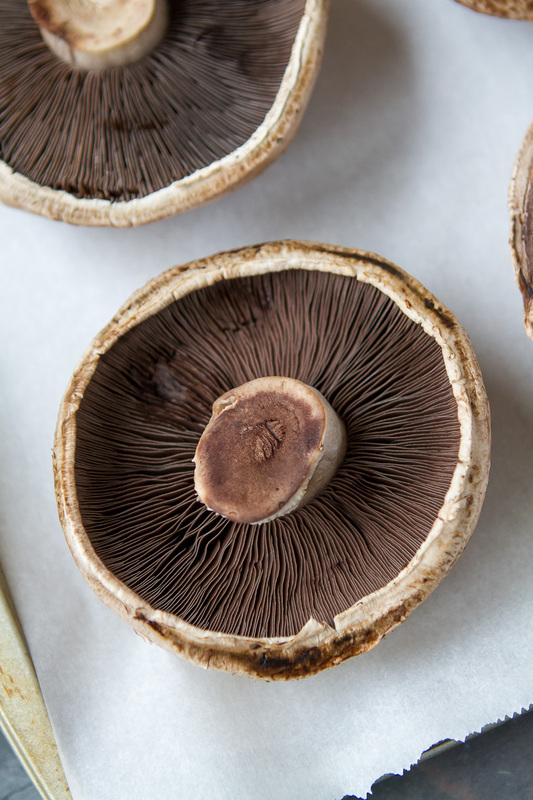 Brush the mushrooms with olive oil on both sides and sprinkle lightly with salt and pepper. Place stem side up on the baking sheet and roast for about 10 minutes, turn them over, and roast until tender, about 10 minutes more. Lower the heat to 375F. Heat 2 T. olive oil in a large saute pan and add the quartered white mushrooms. Saute over high heat until the mushrooms are tender and golden, about 5 minutes, adding a little water if necessary to keep them from sticking to the pan. Add the wine to deglaze and cook until the wine has dissolved. Transfer mushrooms to a bowl. Add 2 T. olive oil to pan and saute the leeks and garlic with salt, and a pinch of pepper until the leeks are wilted. Stir in the red pepper and zucchini, and cook until tender. Add the mushrooms and sun dried tomatoes and continue cooking everything together for 5 minutes more. Transfer to a bowl and set aside to cool. Adjust seasonings if necessary. Add the herbs. Heap the filling onto the mushroom caps, firmly cupping the top to make a dome. Sprinkle with the cheeses and place on a lightly oiled baking dish. Bake until the filling is heated through and the cheese has melted, 15 -20 minutes.